This dive’s primary objective is to deploy the VentCam and the Diffuse Effluent Monitoring System (DEMS) camera at the phoenix vent site and to recover the device that Bill and Kang deployed on dive 4741. Secondary objectives of this dive include taking 5L of bottom water using the small Niskin system, deploying a portable dot pattern screen analog of DEMS, and recovering one coated High Temperature HOBO from the Inferno vent. Tertiary objectives of this dive are to collect rock samples. All objectives accomplished. The VentCam was successfully deployed, targeted onto phoenix vent focused flow, and confirmed to be operational. The DEMS camera system was successfully deployed, positioned over phoenix vent diffuse flow, and confirmed to be operational. The portable dot pattern screen was deployed, imaged and recovered. 5L of bottom water were sampled with the Niskin system at various locations. The coated High-Temperature HOBO probe was recovered from inferno vent. Rock samples were collected from regions of recent (2011 eruption) flow and old lava flow. 16:30 VentCam sighted at drop zone. move to approach. 17:06 markers #73 and #74 identified. confirmed we are at phoenix vent. white bacterial mats. emission confirms, VentCam is operational. 17:25 Collecting Niskin #1. awaiting confirmation from ship on VentCam alignment. 17:46 rock sample #1. Folds of sheet flow at DEMS landing site. 18:30 verified VentCam lights come on. 18:35 placing Portable Random Dot Pattern. 18:39:22 picture of Portable Dot Pattern crush. 19:08:17 leaving phoenix. Heading to Inferno for HT HOBO retrieval. 20:56:00 imaging rock sample #4. may not in fact be old flow given the amount of glass present? 20:58:21 at site of old flow. retrieving rock. very brittle. having difficulty. 21:08:46 rock sample #5 imaged and placed in basket. proceeding move to region of new flow. 21:37 field of yellow bacteria clumps. retrieving rock sample #7 from this location. 21:44:32 attempt a final rock collection. failing in attempt. 21:47:43 battery low. moving to departure zone. 21:50 permission to surface granted. dropping weight. heading up. It’s amazing that you can get down to 5000 ft in 1 hour! It astounds me that such a large fish live at such depths. Did you deploy anything at the vent sites? Congratulations on a successful dive team ASU! What an incredible journey you are on Cody! We’ve been checking your blog periodically and Bryce just loves looking at his Uncle Cody’s pictures as much as I’ve enjoyed reading about it. Keep up the good work! Bad news, followed by good news, followed by disaster, followed by insanely good luck, followed by bad luck, followed by a fighting chance. That about sums up the past two days and brings us up to now. Bad news first. In the week we’ve been out here, Alvin has been able to dive only twice. From a passenger standpoint the weather is beautiful. Blue skies, sunshine, t-shirt and shorts on deck. Calm seas spread out across earth’s round dais and the sky so blue and flat, the sun’s orb so perfectly hung that the whole world appears as if through a tilt-shift lens. The Thompson (our sister ship) appears in the distance, bobbing on the horizon like a Battleship game piece. Sadly, it isn’t the weather you are experiencing that counts, but the weather that you might experience from which decisions are made. The potential loss of life with the Alvin means that the probability of weather must be considered both during launch and recovery operations. Foul weather, or more accurately the threat of foul weather has prevented Alvin from diving twice and an electronic error prevented it from diving yesterday. Most of the experiments on the cruise rely on Alvin’s manipulators to perform. And since our CTD has been down, that left Woods Hole’s Sentry and ASU’s Sensorbots as the only two exceptions on this cruise. This emphasizes the importance of our success. Unfortunately, we’ve faced considerable setbacks, starting with a microscopic soldering error deep inside one of our boards. It wasn’t repairable at sea and forced us to go to plan B early on. Now, the good news. Realizing the soldering error we moved to our backup electronics. Our guys on the beach (meaning our lab at ASU), scrambled to finalize some computer code for the backup plan. Their hard work, combined with Greg’s final insight into the memory writing subroutines and we had it working. That much has been true since day 3. Now the disaster. After waiting our turn for the winch, which was busy dropping cameras with acoustic release-beacons for Alvin to play with on the bottom the following day (which never ended up happening as explained above) we got on deck with our modems at 4am. The plan was to do a short 200 meter drop and back. Looking back, I should have known something was wrong because the upward facing modem blinked off a few moments earlier than it should have less than 2 meters underwater. At that point there was nothing to do but control the winch and wait for the modems to return. When they did come up, the top housing was flooded with sea water, battery acid and some sort of congealed yellow material resembling gobs of hardened chicken fat. Understand that the housings were specifically Alvin Dive Certified with a pressure test record down to 2-kilometers depth, which was obtained on each housings at some expense. Needless to say, we were crushed and likely everything inside was too. High pressure saltwater and powered electronics don’t mix. Think dropping your $100,000 computer (you’ve got one of those, right?) into the toilet, for an hour, add salt, and extreme pressure, and you’d know what we were thinking when it came out on deck. Now for the insanely good luck. Triage in main science begins with getting the modem housing open. Since seawater rushed into the housing at potentially 200 meters, you can’t just open it because the remaining air inside is still under pressure. “But won’t the water just get out the same way it got in?” you ask. No, because holding in water is not the same as keeping it out. Think about how your car door only opens outward. Anyway, the flooded housing was opened as slowly as possible but it still had enough pop to explode in my hands. Breaking some screws and scaring the pants off Greg. If we had gone to 1.5 kilometers the housing would have blown my hand off, a hole in the sink and still had enough oomph to go through the hull. And now, bad luck. As we continued to run and test the boards, I resealed the housings with fresh o-rings and grease. In doing so I found the flaw that led to our housing failure; The origin of the problem was that when the housing is screwed shut, the boards could catch on a surface and release pressure on an o-ring while the system was at atmospheric pressure. If this particular o-ring releases from its groove then the high-pressure salt water will push it right through into the can. So we did a pressure test of the now re-sealed empty housings down to 500 meters and they held as they were intended to do. It seemed like we were a go. But, and here’s the thing about salt water corrosion, it continues even once you’re dry. By the time we were ready to deploy again, the boards ceased functioning. Finally, the fighting chance. WHOI electronics engineer, Al Duester, has a kit (and a mind for electronics) like no other. Back-ups of back-ups of back-ups of things he might need, ad infinitum. From resistors to oscilloscopes he’s like a turtle – he carries it all on his back. I wouldn’t say it to his face but when it hits the fan, “Let the Dues loose!” So Al gave us a back-up computer of a type similar to the one we lost. The beach team has written new code for it since it required different library files and Greg is busy as I’ve ever seen him soldering new connections and overcoming wiring issues. Everyone who reads this to the end, pray for us. Thank you. We’re still fighting. Jean Piaget knew that true learning occurs by analyzing mishaps and mistakes. I know it won’t be of too much cheer, but look how much you learned about high powered salt water and the perils of popping modem housings!!! Nonetheless, I am, indeed, praying for all you intrepid scientists. The theme of this cruise, the common thread that binds all the research going on, is future instrumentation and sensor development. Researchers from Woods Hole Oceanographic Institution, Lamont–Doherty Earth Observatory, University of Idaho, University of Minnesota, Institute GNS Science (New Zealand), and of course, Arizona State University’s School of Earth and Space Exploration have come together on this cruise to push the boundaries of measurement in the most extreme place on earth, the hydrothermal vents at the bottom of the ocean. The world of the deep ocean is way beyond intuitive experience. The first difference between surface water and deep water is the total lack of light. The last of the sun’s photons having been absorbed nearly 1.3 kilometers above you in the first 200 meters of ocean called the photic zone. It is absolutely pitch dark at the bottom, the only light we see is what we bring and what is produced by occasional marine animals. There are no plants here, only animals. The second difference is the pressure. Seawater is about three times as dense as a skyscraper – no steel beams or concrete but much less empty space. The Empire State Building has a density of about 342 kilograms per cubic meter and seawater has a density of about 1027 kilograms per cubic meter. That means 1.5 kilometers ocean depth is equivalent to having a 4.5 kilometer tall building on your head! Ironically, the only thing that saves you is that it also presses in on you in all directions. Alvin’s small titanium sphere (that three of us squeeze into), “the ball”, is spherical precisely because we exchange structural strength for material strength through the use of the sphere’s basic shape. The third difference is the water itself. In contrast to the approximately 2 to 4 °C ambient water temperature at these depths, water escapes from the vents at temperatures ranging from 60 to 460 °C. Around Axial these days we are hard pressed to find anything much above 350 °C. Due to high hydrostatic pressure, deep heated water can exist in both liquid form and as a supercritical fluid, possessing physical properties between those of a gas and those of a liquid. Realize that it’s not boiling even when it’s 460 °C! Besides being superheated, the water is also extremely acidic, often having a pH value as low as 2.8 – approximately that of vinegar. Our project involves two different components. The first component relates to a novel, high-temperature glass material which is being developed for future use as a subsurface fluid flow tracer. The second component further develops a new approach to high-speed underwater sensing and wireless communications networks. Both project components are ambitious experiments that progress the mission of the National Science Foundation by providing foundational engineering research with the long-term potential to transform our approach to ocean science, education and policy. The goal of the first component is to test the stability of a new type of non-toxic, chemically-inert fluorescent glass in hydrothermal vent fluid. If the material can withstand the complex chemical environment of high-temperature vent fluid for an extended duration, it could potentially be used as a tracer for mapping subsurface fluid flow in the future. Such tracer studies will help to address some of the most difficult but fundamental questions we have about the Earth, including: How deep within the Earth does life live? What limits the growth of life in these extreme environments? How large is the subseafloor biosphere, and what role does it play in the carbon cycle? We will test this inert non-toxic material by attaching it to temperature probes and placing the probes in direct contact with high-temperature hydrothermal fluid for 2-3 weeks. Probes will be placed into hydrothermal vents using the Alvin Submersible. We will examine the material before and after vent fluid exposure using fluorescence microscopy, and evaluate any changes in its physical and optical properties. The goal of the second component is to characterize the range and stability of an optical multi-hop sensor network. Sensor networks employ a spatially distributed array of communicating nodes, in which each node collects and transmits data to its neighbors in a web-like fashion. Sensor networks allow scientists to monitor dynamic phenomena over an extended area simultaneously. Optical multi-hop networks will form an important part of the communication backbone for distributed, underwater sensor data collection to help monitor ocean phenomena over wide areas and volumes. Such networks can be joined by passing Remotely Operated Vehicles ROVs, Autonomous Underwater Vehicles AUVs, or other sensors (like those used to monitor the tracers described above) to relay data to each other or onto a cabled observatory or surface buoy for real-time reporting. On this cruise, we will test two optical modem modules deployed multiple times at varying distances apart along a cable. The data will be statistically combined in order to model and plan for future sensor network missions. This was a long one, not really suited for a blog perhaps. I hope you made it through and maybe learned a little too. Sounds like fun! Keep up the good work. OMG, what you’ve been through just to stabilize yourself. And now, to carry on with your great experiments. Thank you! Wow. I guess I shouldn’t be surprised by how little we know about the subseafloor biosphere and its role in the carbon cycle. You are true pioneers! Keep up the good work. I can see the many practical applications for this work in so many other fields! On another note, should I contact the Guinness Book of Records to see if you are the tallest person to have gone that far under the ocean?! Weather picked up last night, winds gusting to 35 knots with 15 foot swells, projected to increase throughout the day. Two years ago out here it was sustained 50 knots and 50 foot waves for more than two solid days and about like it is now for nearly two weeks. Someone broke their ribs that year when they got tossed out of their bunk by the motion of the ship. Now though, sitting comfortably inside the hulking 270 foot Atlantis, the fifteen-footers split like hollow logs against our bow. Pitching down the back of the wave produces a feeling not unlike when your car cruises over an unexpected rise in the road. By now we’re hardened to the sensations, but we are none-the-less depressed by them. Depression sets in because even mildly bad weather like this is a game changer for deploying anything over the side of the ship, especially manned submersibles. Alvin deployment and recovery is perhaps the last ship operation in the world that still requires swimmers in the water. My guess is that insurance considerations will put a stop to this before too long. Watching them out in the sea is looking back in time, a throwback to the days of Jacques Cousteau. The color palette reduced to just five colors: blue, white, black, day-glow red, and sometimes yellow. It so happens that the divers are perhaps the best looking people on the ship and the risk they endure with every dive adds to their mystique. Alvin operations require swimmers at sea. Amanda Wilber has proven herself a valuable member of the crew. Despite what may be the beginnings of the flu, Amanda continues to work tirelessly in the main science laboratory. I think it’s the flu and not standard sea sickness because her bunk-mate, a tried and tested seaworthy soul, has been down for the count since day one. Amanda keeps busy, assembling components for a high-speed underwater camera. Once deployed, the system will monitor the flow rate from a hydrothermal vent. Amanda is also now in charge of summarizing the daily weather for the final cruise report. Greg Wells keeps his nose to the grindstone. His mind must form some sort of barrier to the tumult around him as he works two feet from his screen for hours. From the look of him now, you’d think he was still seasick. His pallor is slightly green and waxy and the only reflection in his eyes is the computer screen in front of him. When he does get up, his color returns, he’s all smiles and promises me he’s having fun. I will post again in a few moments a detailed description of the experiments we are conducting. Cody – Awesome to hear/read about this very exciting adventure you’re on. BTW, though I shouldh jhave checked this out earlier, Is there anyone we can contact to get your stuff (bio, results from prior, etc etc)? I got in touch with Logan Liu; waiting to hear back from him. Are you getting mail? While the world is on the brink of so much disastrous grief, it’s so wonderful that you ASU scientists are doing something deep under the ocean to make the world a better place! Cody and the crew are clearly amazing scholars/researchers and are to be congratulated for all their extraordinary work on behalf of all of us! Stay safe and keep your superlative gift of writing coming, Cody! Sounds like so much fun. Wish I could have gone also. Thank you for keeping us posted. Your blog is very informative and amusing. I hope everyone is feeling better. We have arrived above Axial Seamount after 21 hours of transit from the port in Astoria. Yesterday was overcome with spells of sea sickness and drug-related drowsiness, which was difficult to tolerate through all the safety orientation meetings. Pale-faced and dizzy, we mustered to the main science lab with life jackets and inflatable survival suits (reminiscent of Gumby costumes) and were instructed on what to do when we hear certain alarms. Seven short rings followed by one long translates to “Abandon Ship!” – code for grab your survival suits, iPods, cellphones, and anything else you want to bring home and get out on deck. The Alvin divers and team members were then instructed to meet in the library to view a presentation and try on military-grade oxygen masks. To make sure the mask is sealed effectively, all bearded men are asked to shave before diving on Alvin. After a day full of drills, meetings, and vomit, we were able to spend some quality time together watching Troll Hunter in the ship’s theater room. The tasty steak dinner was a pleasing accommodation to our movie night – at least for those of us who could keep it down. Violent ocean waves rocked us to sleep and we awoke feeling rejuvenated and better adapted to the motion. Today at 08:00, the first Alvin dive commenced with Chief Scientist Tim Crone inside. Like a seasoned sea dog, Cody stepped out on deck to bid farewell to Tim and watched as the submersible was rolled out on tracks and lifted up and over the fantail of Atlantis. Two Divers stand atop Alvin as it’s launched to secure the hatch and remove the rope. Tim is going down to place a beacon on a mooring left by the Scripps Institute. Unfortunately, the mooring contains glass spheres which pose a threat to delicate exterior of Alvin and the autonomous submersible Sentry. The beacon will emit a signal to create a spherical “do not enter” zone surrounding the mooring. Tim also plans to flag hydrothermal vents (black smokers) within the caldera of Axial Seamount. Once flagged, he can update the coordinates of these features and correct any previous errors. Each smoker is given a name: Hell, Medusa, Anemone, Phoenix, Inferno, Fuzzy Tubeworm Bush, Mushroom, Styx, Marshmallow, Virgin, and Virgin’s Daughter. Pictures of these smokers are currently being taken as Alvin lurks below. When they come back up and download the data, we will be sure to post photos! For now, we have time to make programming adjustments to our Sensorbots and help others with finishing details on their equipment. After a long semester of homework and computer screens, it’s quite stimulating to work with my hands on construction projects. I even have a few cuts on my fingers as souvenirs. Walking out on deck is exhilarating as well. The air is fresh and brisk and when the clouds move away from the sun, the deep blue color of the water is revealed. On the starboard horizon, our sister ship, The Thompson, sits in the distance, amidst a hazy fog. reading this with great interest. You write very well. Many of us are excitedly following Cody’s adventure on the research vessel Atlantis! If you want to follow the exact location of Alvin and the Atlantis, you can keep an eye on the Woods Hole Oceanographic Institution’s “Where is Alvin Now?“. Right now it shows that they are at 45.94 N, 130.02 W (off the coast of Oregon). Curious about Alvin? You can take a virtual tour of the submersible. This is the first moment I’ve been able to look at a computer screen since we left port 22 hours ago. That’s not because we’ve been busy, although we have been, what with getting our experiments working, helping other researchers, and the various training and planning meetings. No, the reason I haven’t been able to look at the computer screen is because I physiologically have not been capable. Here’s the thing about sea sickness. Imagine the entire world is spinning without cessation. Massive, inescapable, juggernaut undulations. Asynchronous with varying amplitude. Any attempt you make to anticipate the next wave only makes it worse. The constant slamming, shuddering waves against the ship, like a knock on your brain stem and a rancid pulse in your stomach. That and the foul pockets of diesel odor and you don’t stand a chance. About five hours in and I started to crack. Six past cruises and I’ve got a system. No, not drugs (I’ve tried them all), no pressure point wrist-band nonsense either. For me, it’s nothing but saltine crackers and bug juice, that sweet red sugar-water the galley has in constant supply. That’s the only stuff that tastes and smells about as neutral going down as it does coming back up. A confident willingness to pray before the porcelain god and slowly, but surely, one emerges on the far side, a salty sea-dog, an iron-gut sailor. There are two experiments we are conducting here. One involves using the Alvin submarine to place a new type of fluorescent material we have developed directly in the orifice of a hydrothermal vent. 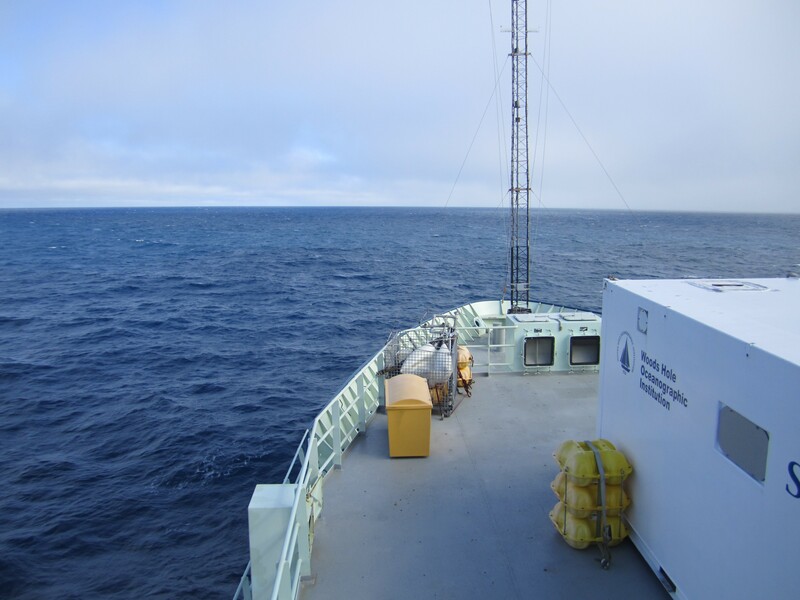 The second experiment is conducted from on deck, sending optical modems over the side of the ship by instrumented cable. We have arrived onsite now. 1.5 km above Ashes Vent Field. It’s 6:00am, the sea is calm and the sky is grey and misty all around. I’d much prefer a grey morning as I’ve found the old adage to be true – “Pink sky at night, sailors delight. Pink sky at dawn, sailors forlorn.” Ashes is a hydrothermal vent field located within the Axial Seamount caldera. Alvin’s first dive has been selected as a Pilot in Training (PIT) dive. PIT dives are mandated to keep the Alvin pilots certified in good standing. Doing the PIT first will give us three certified pilots for the rest of the cruise and make their rotations easier. One final note for this post, our internet connection is the worst I’ve experienced out here. Past cruises I’ve been on were with a Chief Scientist who paid an extra $15k per day to provide additional dedicated bandwidth. This time, we share the satellite link with five other ships in the UNOLS fleet. We are limited to 10 kilobytes per transfer. That’s okay for text, images are near impossible and video is totally impossible. Even loading the web interface I’m using to post this is a burden. I’ll see what I can do, but for now, it’ll have to be image free. We arrived at the Astoria, Oregon dock just before sunset. It’s a small unassuming place, as far as ship yards go, reeking of fish, timber and diesel fuel. A complex maze of fences and small buildings delineate the busy activity of sailors and dock workers. Today, huge stacks of logs, harvested from the wild Oregon forest are being loaded onto ships bound for Asia. The small port is easy to miss from the main road, and were it not for Ken’s past work here, we would have had trouble finding it. Ken, a friend and colleague from previous cruises, picked Tim, Amanda and me up in Portland for the hour and half drive here from the Portland airport. Once we arrived at the gate we presented identification which they checked against the manifest and we were directed onward to the vessel. The ship glowed magnificently against the dark backdrop of the Columbia River. Seven years of development, more all-nighters than we care to count (too many in the past week), and now it begins. Once on-board, we sought out the captain and were assigned space to drop off our gear. Ken bid us farewell and began his lonely drive back to Portland. The rest of us settled in and got dinner at the karaoke bar at the end of the road. The colorful bras on the ceiling are a testament to the wild times had by sailors and locals. Back on the ship that night we slept soundly in our berths, dreaming of the work to be done the next day and the adventure ahead. Karaoke bar in Astroria, Oregon. In just two days we are heading out to sea, 500 kilometers off-coast and 1.5 kilometers down. Research at sea, and on the Atlantis in particular, is a mixture of both tradition and dream. Most of the procedures and equipment on-board were designed decades ago, born of hard learned lessons from the stormy sea – a stark juxtaposition to the advanced technology and robotic cargo we carry. This balance between old and new, sea-worthy and delicate, are part and parcel to everything here, especially the people. Each research group is assigned space on the ship’s main level. Alvin and crew are permanent fixtures on the Atlantis and they take up the whole fan tail and loading bay. The rest of us squirrel away where we can. While everyone helps each other whenever needed, each group is an island. You carry everything you will need for your research and personal needs, sans drinking water and food. Your research field kit is a source of pride and arguably competition. Of course, organization is key: “the micro-hex drivers are in Pelican case number eight, layer three, fourth row over as listed in the packing log book”. Groups from Woods Hole Oceanographic Institute have a fifty year head start in the kit competition. Still, I’m proud of ASU’s School of Earth Space Exploration style and we rarely have to ask for anything. That said, we needed a “slotted socket driver” today and the ship’s machinist was kind enough to oblige us by making one. We don’t leave port for another 24 hours. In that time we are preparing our experiments, getting to know each other, and coordinating dive plans. For our work, we are busy installing the latest firmware on our microcontrollers, attaching connectors, charging batteries, and preparing lines and cables. At 14:30 hours today we had a meeting to plan the upcoming Alvin bottom time for the next two weeks. Every dive is numbered, and every piece of equipment and passenger to be carried on that dive is accounted for before we leave port. Dates are not assigned to the dives because weather dominates all considerations at sea, except for perhaps considerations of human life. If a dive is delayed (or worse yet scratched), who cares what day of the week it is anyway? None of us have purchased our return tickets home yet for that same reason. We are committed to the mission and are flexible to change and opportunity. As luck happens (for us anyway) a member of the science crew got very sick and couldn’t make it. The chief scientist offered the room to another student at the last minute and I took the opportunity to argue our case. I’m happy to say we are flying Greg from my lab out tomorrow morning to join us. He’s been with the project since the beginning and he’s deeply knowledgeable of the instrumentation. That and his calm-under-pressure attitude are just what we need to make things work. Some of the boards are not programming as they should and we may have to go to back-up boards at sea. But with Greg, our chances go way up. Tomorrow we will be welcoming Greg and together we will attempt to finish our preparations. We leave port early Monday morning and will be diving in the Alvin on Axial Seamount two days hence. We will keep you updated through this blog on the experience, engineering and discovery to come! This is really cool Cody! I like the colorful detail of the events and feelings going on. Hopefully you and Greg get some good experiments in and have fun while your at it. I felt like I was reading a novel, it made it feel like I was along for the ride.